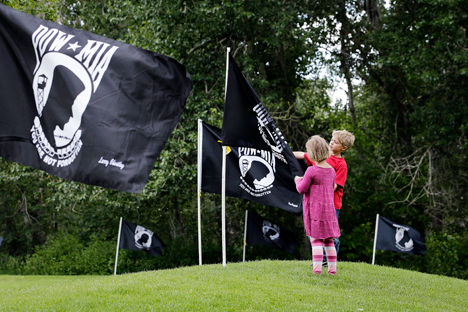 Children look at a POW-MIA flag, Hailey, Idaho, June 21, 2013. The U.S. delegation arrived in Moscow on Nov. 11 as part of work of the Russian-U.S. joint commission on the issues of prisoners of war and missing persons, a source close to the commission told TASS. "The U.S. delegation led by co-chairman of the American part of the joint commission Robert Foglesong has arrived in the (Russian) capital on a working visit," the source said. Foglesong plans to meet with the co-chairman of the Russian part of the commission Col. Gen. Valery Vostrotin to sign a joint protocol after the 20th plenary session of the joint commissions held this May in the U.S. The source said the meeting takes place at the initiative of the U.S. side.